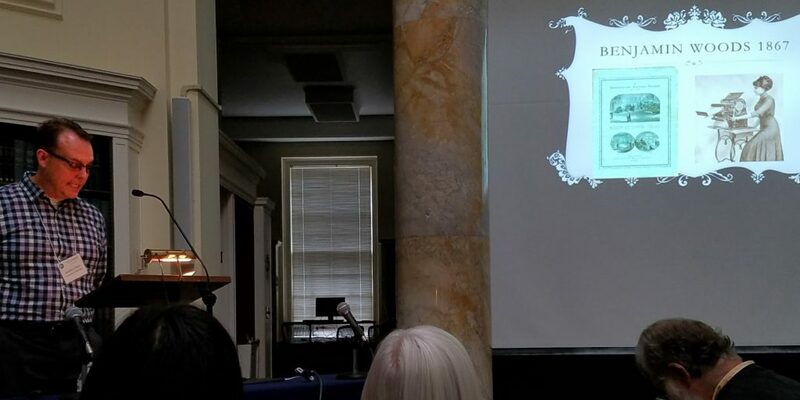 Jennifer Chuong presented research that she completed during a fellowship at the American Antiquarian Society. She contrasted the “strong” printing of letterpress and engraving and the “weak” printing of marbling. In contrast to the marbled papers that were produced in France, Germany, and Britain, marbling in early America was almost always found in close proximity with letterpress-printed text. 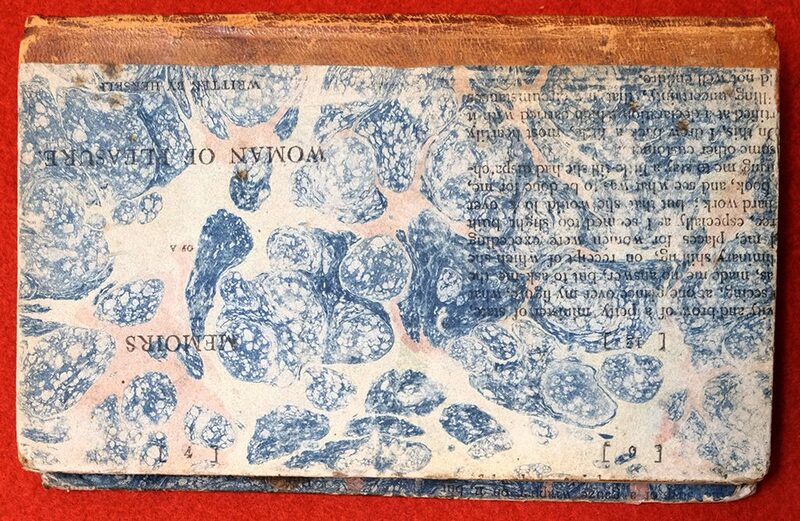 In some cases, marbling appears only in the margins of documents; in other cases, it covers the entire surface. The looseness and indirectness of marbling forms a stark contrast to the rectilinearity of text printed via traditional letterpress methods. Marbling is also more vulnerable to wear, and abrasions degrade marbling over time. In the colonial era, marbling pigments were mixed with oil and turpentine. Early marbling patterns that were used in America include Spot, Shell, and Stormont. Chuong concluded that marbling complicates the traditional notion of the printed page as a stable entity in time. The pattern that marbling adds to the page transforms the printed page. The pattern of marbling transforms the printed text into mere pattern, and yet, as the marbling is abraded, the printing below is again revealed. In addition, marbling can signal authenticity and value. The relationship of the static, linear appearance of letterpress and engraving and the looser, more organic appearance of marbling can even be read as a visual representation of tensions in the new American republic. Jeffrey Croteau’s presentation highlighted a distinct stream of early American printing and publishing in which cultural and political trends were captured alongside information that aided daily life. After the abduction and murder of William Morgan in 1826 there was a notable rise in the publication of anti-Masonic material in America. 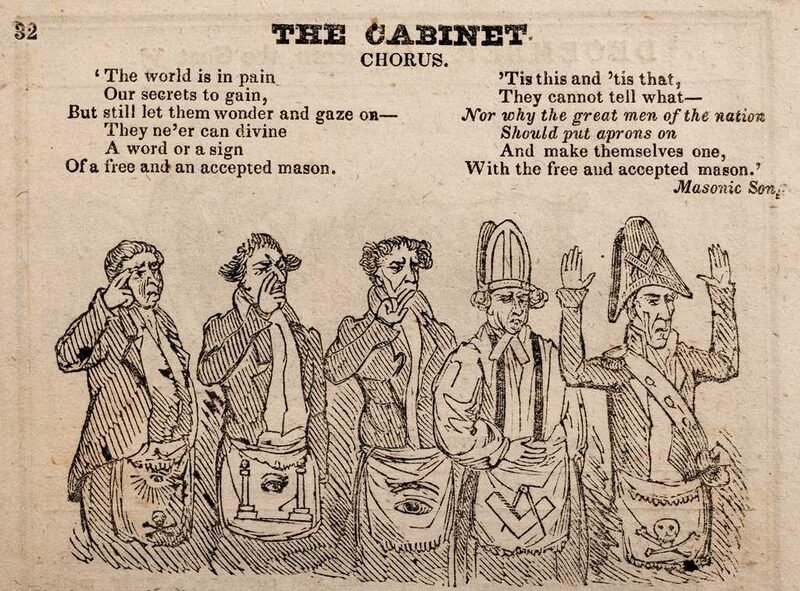 Between 1827 and 1837, anti-Masonic sentiments grew and hundreds of Masonic lodges closed. Printing offices dedicated to the anti-Masonic cause flourished during this time period and they published broadsides, pamphlets, newspapers, and journals. In addition, they published Anti-Masonic almanacs. Almanacs contained useful information, such as astronomical calculations. Many American households purchased an almanac every year. Almanacs were published in very large editions and cover prices indicated that publishers intended to sell them by the dozen, the gross, and the hundred. Though the utility of almanacs was of primary importance for both the publishers and the purchasers, almanacs reflected specific points of view such as anti-Masonic sentiments. Other themes reflected in almanacs of this time period include anti-slavery and temperance. In addition to anti-Masonic opinion pieces and advertisements for other anti-Masonic items, images in almanacs reflected the story of William Morgan’s death and Masonic rituals. This may have reflected anxiety about the primacy of Masonic allegiance over patriotic support of the new American republic. The rise of Freemasonry and the corresponding anti-Masonic movement are one element of early American printing history that can be studied at the American Antiquarian Society. In 2003, the AAS published Freemasonry, Anti-Masonry and Illuminism in the United States, 1734–1850 : A Bibliography by Kent Logan Walgren, which is a definitive source on this topic. 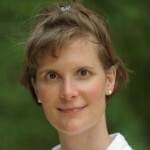 In 2015, Kathleen Walkup held a fellowship at the American Antiquarian Society. While at the AAS, she analyzed descriptions and images of women in the printing trades in the nineteenth-century. Walkup noted that women were employed in the printing trades in three main areas: as compositors, as press feeders, and bindery workers who did forwarding, folding and sewing. Of these three, compositors were the highest status and their work was captured in text and image more often than the other two. Women also fed paper into presses. Folders often worked at home and combined their piecework with caring for their families. Sewers, on the other hand, worked at the bindery and were paid higher wages than folders. Walkup also observed that in the context of her research it was important to ask the question, “which women?” The women who worked in the printing trades were often middle class women who worked in order to help support their families. Women were paid one-half to two-thirds the amount that male workers were paid. Some were able to support themselves, but others were dependent on cooperative living arrangements with family members. These issues were not unique to the printing trades but relate more broadly to changes in the employment status of nineteenth-century American women. The images of women in association with presses were of particular interest. Women were pictured as press feeders in advertisements for presses to suggest that presses were easy to operate. 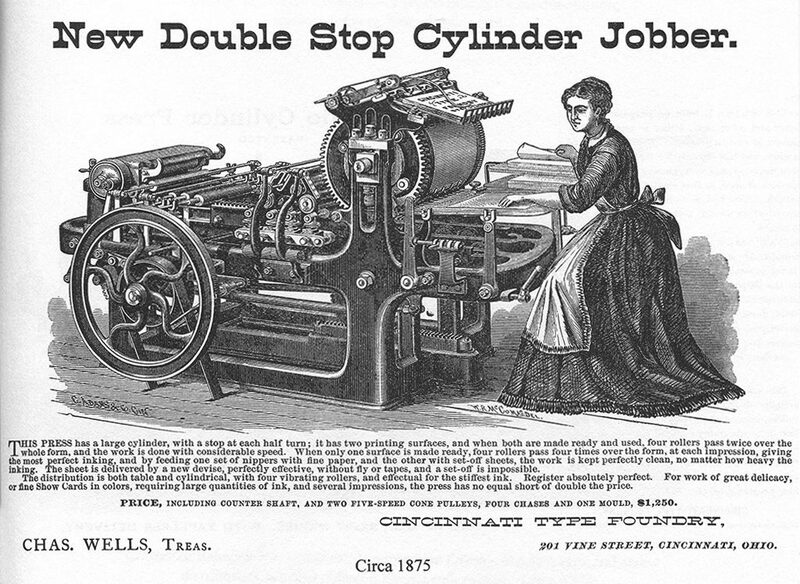 The idealized image of a well-dressed beautifully coiffed young women with a lovely figure feeding a blank sheet of white paper into a large industrial machine were in stark contrast to the depiction of grimy shop floors filled with rows of presses which were powered by belts and shafts that mandated a steady pace of production. Walkup’s research has, in fact, revealed accounts of repetitive motion injuries and stress-related illnesses that stemmed from work in industrial printing facilities. This is just one aspect of a stream of valuable research that Walkup has been conducting about the ideals and the realities of women’s printing history. Jonathan Wells asserted that the antecedent to desktop publishing was the amateur printing and publishing movement which swept America from 1860 to 1920. During this period, young people published hundreds of titles. Small tabletop presses and collections of type made this possible. Many publications were printed in a 4-page (folio) format, with two columns of text on each page. Teen journalists wrote, edited, and printed publications that helped to foster communication. This was especially powerful during the period following the Civil War, a period in which the number of publications increased dramatically. The American Antiquarian Society has many examples of these publications in its collection. These publications have recently attracted scholarly attention because they provide insights into the social and intellectual lives of young people during this historical period. Journal included features about stamps and baseball as well as jokes and puzzles. The content of these amateur publications allows historians to study teen subcultures in a range of populations. In addition, they provide a window into the development of American journalism because these papers often served as training grounds for aspiring reporters and editors. Amateur press associations were founded in the late nineteenth-century and played an important role in distributing publications. The associations held meetings and conventions and fostered the culture of amateur printing. However, the competition for leadership positions in these associations was fierce. There was also controversy and strife regarding race in these associations that reflected events in broader American culture. This represents just one stream of research that these surviving printed products of the amateur press in America can offer contemporary readers.